Pannal Golf Club has been welcoming avid golfers to its excellent course for over a century, since the layout was inaugurated with a match between James Braid and Harry Vardon. Revisions to the original design were completed in 1933, and Pannal's parkland course remains largely as it was then. The course hosts Open Championship regional qualifying events, which are testament to its quality. The gentle undulations of the North Yorkshire countryside set the scene for the splendid layout, which measures 6,622 yards at its full length. 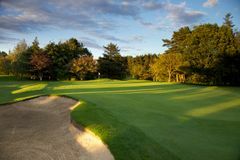 This is not the longest for a modern tournament venue, but the design is subtle and varied, ensuring that every facet of the game is tested thoroughly. During your golf tour in historic York, be sure to visit the charming and welcoming Pannal Golf Club. Probably the most challenging course we played out of the 3 and very long. We probably should have played this course on the 1st day, the day we arrived so we were fresh and ready for the challenge. However, a very good test and certainly worth the visit!